Spring Classes started with Empty Spools Seminars, where I taught a 5-day In And Around Town workshop at Asilomar in Pacific Grove, CA. 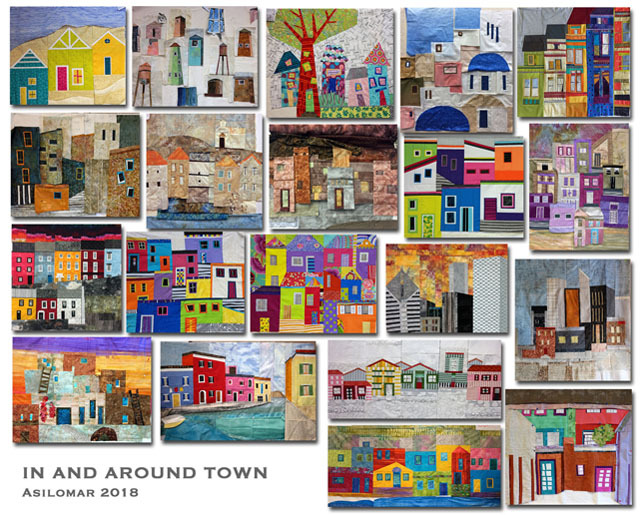 City scapes, street scapes, villages, neighborhoods, castles, houses, barns, doors, windows, anything that has a dwelling or part of it serves as inspiration for this workshop and this year we even had historic water towers and tank houses of Sonoma County, CA. Some of the places we visited were Portugal, San Francisco, Italy … several times, Chicago, Ireland, Croatia, Arizona, Greece, New Mexico, and some stayed in California. All these works are pieced … we make lace for embellishing … we discharge fabrics to create weathered looks … we work hard … we share … we enjoy our time together as a group. This was our large classroom with plenty of room to spread out, and we did spread out! The community scrap pile in the center of the room came in very handy for that bit of yellow we needed or for that special treasure that was someone else’s discard. ... and here they are, all 20 of them! Of course, there is always time to wander the beaches of this beautiful place. See you next year in March! Hilde, thanks for sharing your beautiful photos. Your class was one of my favorite workshops at Asilomar! These quilts absolutely scream with happiness! Congrats to a wonderful teacher! I have fond memories of working in that room in 2017, and of being at Asilomar–an almost magical place. I loved your class, Hilde. These quilts are all amazing, beautiful, so different, and fun! Fabulous work by your students, and so varied! It probably doesn’t hurt that they have an excellent teacher, either! Love the photos of the beaches - one year, I’ll get myself to Asilomar, it looks heavenly. What a great class and gorgeous location! Wonderful and unique work from all of your students! Hilde, You are awesome and your photography is outstanding. What great work they produced!! I used to go to Empty Spools when I lived in California. Love it there.